le V8 401cid est en option "Go Package"
1972 Javelin AMX WITH "GO PACKAGE"
Vehicle Description : The American Motors Javelin AMX was restyled in 1971 and remains one of the sleekest designs AMC ever produced. Winning the 1971 and 1972 SCCA Trans American Road Racing Championship gives a true racing heritage to the Javelin/AMX. The AMX was the factory designation for these top of the line Javelins. In 1972 AMC replaced the Borg Warner automatic transmission in favour of the bullet proof Chrysler-type 'Torque-Command' A727 in all 360 and 401 V8s. 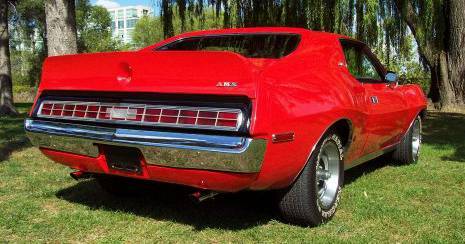 Total production in 1972 of the AMX was 3,220. In 1972 an AMC 401 V8 was rated at 255 net horsepower at the rear wheels. Among them was the 401 "Go Package" which included the 401-cid 4-B engine, dual exhaust, T-stripe hood decal, black rear panel, Rally-pack instrumentation, handling package, cowl-air carburetor induction system, heavy duty cooling system, twin-grip differential, power disk brakes, E60X15 Polyglas white-letter tires, 15X7 inch styled steel wheels. 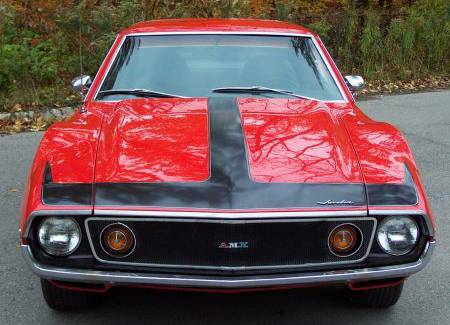 This Javelin AMX is finished in the original Trans AM red exterior with a black vinyl interior. It is equipped with the "Go Package" with the 401 V8 and a three speed automatic transmission. It comes with complete documentation including the original sales brochure, original warranty card, original "Bill of Sale", original "Window Option Sheet" and has only 72,000 original miles. Other Factory options include a rear window defroster and tilt wheel. 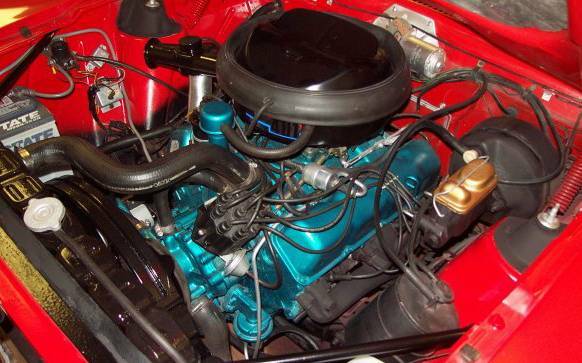 This car has all original equipment with the exception of an edelbrock carburetor.